Following the same line of questions that we frequently get here, this topic has to be in the top ten. Let me start by saying that most of the bareboat inquiries that we get and the quotes that we send out, do not include the cost of the provisioning. At some point however, the issue arises, many times after the boat has actually been booked and the number of guests finally nailed down: what, where and how are we going to eat while on charter? 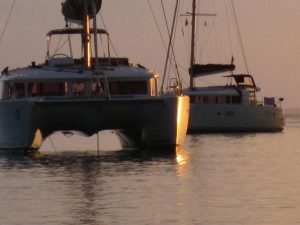 If you are bareboating in the Mediterranean, for example, most experienced bare-boaters will arrange their provisioning so that they can eat breakfast and lunch on board and eat ashore every evening. This is true for crewed charters as well. Of course in the Med, every little island you visit has really neat and for the most part, inexpensive little tavernas or trattorias that serve local fare, so this is definitely an excellent option. The Caribbean is quite different, and the local restaurants are pretty expensive, the food indifferent and “local fare” is defined as hamburgers. There are, of course, honorable exceptions and there are also some excellent restaurants all over the Caribbean but the prices are pretty unbelievable. For the best culinary experiences in the Caribbean, try the French islands, including St. Maarten, St. Barth, Martinique, etc. But for those of us who are die-hard BVI fans, my favorite routine is to take all breakfasts, some lunches and some dinners on board and perhaps eat lunch ashore a couple of days and dinner ashore perhaps 3 or 4 evenings during the week. 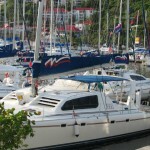 a) Most of the bareboat companies we represent offer a provisioning service. We send you the forms, you fill them out, tick all the right boxes, and bingo, the provisions miraculously appear on your bareboat at the base when you arrive. This is especially true and a good idea in the Med where there is always a language problem. Some bareboat operating companies have several different provisioning plans to accommodate your needs. We have full provisioning and split bareboat provisioning options. 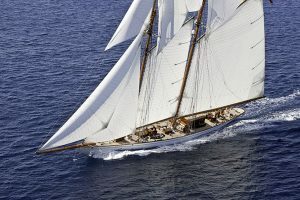 Don’t forget to use this form as your main resource for bareboating worldwide. Use our search-engines to find the perfect bareboat in the perfect place at the perfect time.